This Friday, January 29, 2010, Uranus re-enters the sign of Pisces where it will remain until 2017. As I described in a previous post, Uranus and Neptune were involved in a parivartana yoga, or mutual exchange of signs, for 6 months during 2009. This means that Neptune was transiting the Uranian sign of Aquarius, and Uranus was transiting the Neptunian sign of Pisces between April 6 and October 2, 2009. 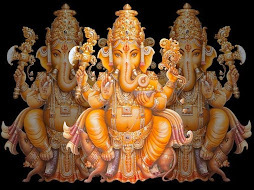 In Vedic astrology a parivartana yoga is a special relationship and union of energies. It indicates that each planet takes on strengths and characteristics of the other. During this first exchange we certainly witnessed many strange (Neptune) and sudden (Uranus) events that revealed truths like a fog lifting in sunlight. New stories were multi-dimensional, with layers of truth, illusion (Neptune), and dissent (Uranus) woven through them, like the worldwide hype over the H1N1 virus and vaccine; the debate over public health care; the discovery of exo-planets orbiting distant stars; the politics of the disclosure movement; and the recurring alien memes infiltrating the media, film and even the Vatican. This mutual exchange of the gas giants was broken in early October when both planets temporarily retrograded back into the previous signs of Capricorn and Aquarius. On November 1, 2009 both went stationary direct. Neptune returned to Aquarius on December 8, 2009. And when Uranus returns the sign of Pisces this Friday the intriguing pair will be energetically bound to each other for 7 years. The last time a parivartana yoga was created by these two gas giants occurred in 1846, when Neptune was discovered. In the early 19th century, Neptune was not observable even with optical improvements to the telescope. It was unexpected changes observed in the orbit of Uranus that led astronomers to find the illusive planet. Using mathematical calculations, they deduced that its orbit was subject to gravitational perturbation by an unknown outer planet: Neptune. Thus, Neptune was the first planet found by mathematical prediction rather than by empirical observation. The revelation of Neptune by mathematics demonstrates part of its hidden, subtle, illusionary, and confusing nature. Modern astrologers assigned its rulership to the sublime water sign Pisces. 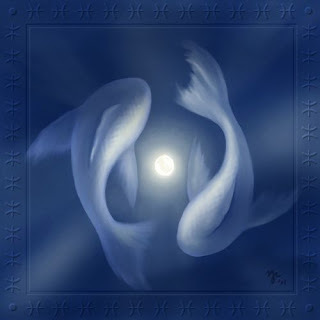 The symbol for Pisces is two fish, swimming in opposite directions like the stream of consciousness flowing back and forth between heaven and earth. Sometimes this stream is clear and sometimes it is muddy. Thus is the dual nature of Pisces. Neptune's discovery occurred during a period of philosophical, religious, and political change. Its appearance coincided with national movements towards ideal society like the rise of communism and publication of The Communist Manifesto in 1848. Modern art movements sprung from a rejection of Realism and state-sanctioned definitions of art to the acceptance the individual suffering artist as romantic hero/god. Abstract and subtle art began to gain acceptance, especially when realism could be captured and easily reproduced in a new medium: the photograph -- first revealed around 1839. And perhaps most significantly for the world today, the industrial revolution was literally fueled by the discovery of oil in 1846. Thus astrologically Neptune is ruled by Pisces, and is associated with psychic sensitivity, imagination, charm, fluids and oil, the media, and film. What is most intriguing to me is that Neptune was discovered in approximately the same mutual exchange that it is currently occupying. Will this century's parivartana yoga reveal that we are in the 'last hours of ancient sunlight' -- ie our oil reserves having been voraciously consumed by the industrial revolution? Or will the sudden revelations associated with Uranus bring new discoveries about oil and fuel, water-based energy, or a revolutionary form of energy? Perhaps the most intriguing synchronistic set of events of 2009 were the Norwegian Spiral, Obama's acceptance of the Nobel Peace Prize, and the release of James Cameron's Avatar. All occurred as sublime Neptune re-entered the stellar fields of Aquarius on December 8, 2009 and all have that Neptune in Aquarius vibration. The blue themes were discussed in previous posts, but I neglected to point out that electric blue colors are associated with the sign Aquarius. 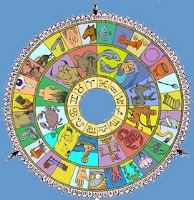 Vedic astrologers traditionally assign the blue-skinned Saturn co-rulership of both Aquarius and Capricorn. But after the discovery of Uranus in 1781, modern astrologers assigned Aquarius to this odd and unusual planet. 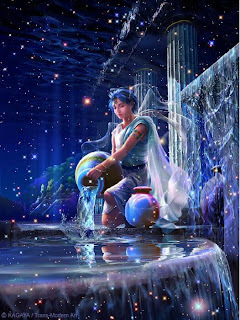 Although an air sign, Aquarius is represented by the water bearer who pours the celestial currents upon the Earth. Its nature is scientific, electrical, intuitive, idealistic, futuristic, and humanitarian. In Babylonian star catalogues Aquarius is identified as GU.LA meaning The Great One and represents the Sumerian god Ea/Enki, whom Zacharia Sitchin describes as the father of humanity in his ancient astronaut theory series. Enki rebelled against his people (the Annunaki) and tried to save mankind from catastrophic earth changes caused by the transit of his home planet, Niburu. Rebellion, revolution, and humanitarian causes are all Aquarian fields of action. In addition, floods and water themes show up in Egyptian, Hindu, and south American star lore about Aquarius, perhaps associated with annual river overflow that occur when the Sun is in Aquarius. The wavy lines of its symbol represent both electricity and water. Uranus is the only planet in our solar system that rotates on its side. Its poles face the sun so that one hemisphere is bathed in light, while the other lies in total darkness. These strange traits reflect its astrological significance as the breaker of convention. Thus Uranus is associated with sudden change, shock, disturbance, transformation, eccentricity, electricity, and invention. So when it enters the Piscean field of the sublime, you can expect to be surprised -- or 'shocked and awed' as some might say -- perhaps even shekhinahed. As Pisces is a water sign, we may see an increase in flooding world wide, especially after earthquakes, which also associated with Uranus. We've also seen many stories about the search for water on the Moon, Mars, and other exo-planets. 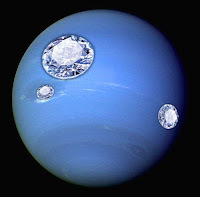 My Aquarian imagination was amused by the recent finding that Neptune and Uranus might contain oceans of liquid diamonds. In addition to being the most sought-after of all precious gemstones, the diamond possesses a dazzling array of technologically useful properties. It is the hardest, most thermally conducting, and chemically resistant of all known materials. 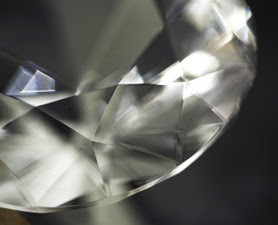 The diamond is also biocompatible, highly transparent and of great interest for use in the electronics industry. And now, it is believed that under the correct conditions, it can also become a superconductor (Evgeni Ekimov). Sounds a little like 'unobtainium' to me. Imagine swimming in a crystal current dotted with diamond icebergs. That's what the next 7 years may have in store for us.